On a bright cold day ‘Ensians faced up to the team two places below them in the League table who had come very close to beating them in the away fixture in September. With both sides without a game for over a month due to frozen pitches, it was the visitors who seemed too settle first as they put together some flowing rugby through good handling by forward and backs. The home side gradually found some rhythm as the game progressed as they struggled to contain the lively visitors. but they managed to hang on to a slender lead to come out on top. From the start the hosts showed their intent by moving the ball wide at every opportunity, but sound first-up tackling by Wensleydale stifled their efforts and they were quick to mount counter-attacks and through good support play they put pressure on the home side in their 22. Slow release of the ball gave the visitors a chance to take a 3-0 lead with a penalty on 7 minutes. From the re-start ‘Ensians immediately went in to the attack with winger Connor Bateman having a strong run down the left. Good support by the back row of Paddy Phipps, Sam Featherstone and Joe Armitage tested the visitors’ defence and, when a gap appeared, scrum half Rob Lofthouse scampered through for a try near the posts. The conversion by fly half Will Cooper gave the hosts a 7 – 3 lead on 13 minutes. The strong-running Wensleydale backs aided by some slick off-loading produced an immediate response which gave them a penalty chance to narrow the gap to 7 – 6 on 15 minutes. They missed a further penalty opportunity to take the lead seven minutes later as the home side struggled to cope with their strong running and support play. In the scrums, the home front row of Toby Keep, Tom Howard and Josh Dyson provided a sound platform for the home pack to exert pressure. Good running by the home backs took play into the visitors’ 22 and from a scrum 8 yards out, the pack drove the visitors backwards with No 8 Sam Featherstone skilfully controlling the ball over the line to touch down for the second try. The conversion failed taking the score to 12 – 6 on 35 minutes. As always, the visitors were quick to respond and they put pressure the home side in their own 22 causing the hosts to concede a yellow card for slowing down the ball. A very kickable penalty was spurned for a quick tap which produced a try halfway out. With the conversion, the visitors now enjoyed a 13 – 12 lead as the half time whistle went. With centre Nick Hesketh and prop Dan Stevens coming off the bench in the first half, ‘Ensians’ confidence increased in the second period with determined defence and a larger share of the ball. The home lineout functioned well through Sam Featherstone and lock Ali Campbell and half backs Rob Lofthouse and Will Cooper spread the ball wide at every opportunity. Unfortunately, the handling tended to be laboured with some passes going astray with the result that several opportunities went begging. From the bench Rob Arbuckle and Josh Smith joined the pack with Nick Keinhorst taking over in the centre. The visitors received a yellow card for persistent offside and the hosts stepped up their efforts through better handling to give them a territorial advantage. In an excellent ‘Ensians’ move which started with strong runs from centres Ollie Eaves, Nick Keinhorst and winger Nick Hesketh on the right, the ball was switched across field where lively replacement flanker Josh Smith took the final pass to go over in the left corner on 61 minutes. The conversion failed, but the hosts had re-taken the lead at 17 – 13. Wensleydale responded immediately with good support play between forwards and backs, but the home side matched this with some fine attacking play of their own. When a penalty was awarded ten yards out, the hosts opted for a scrum hoping to repeat the pushover try of the first half. 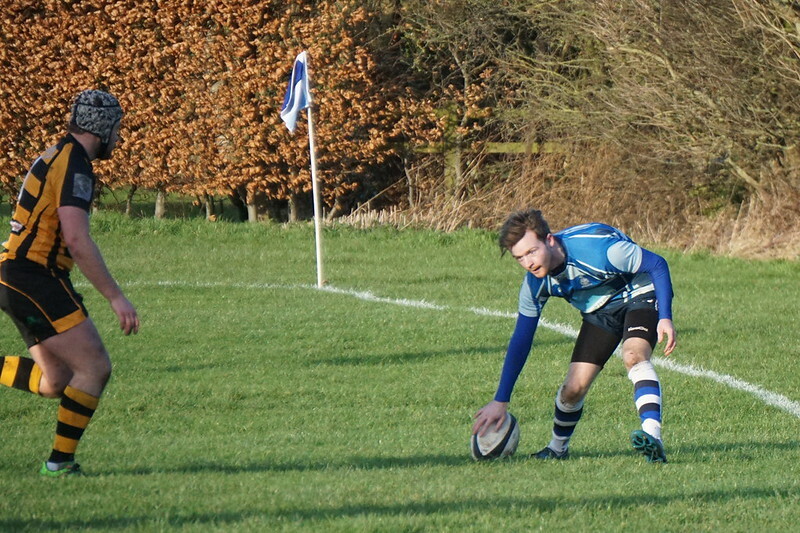 The drive was making good progress when unexpectedly the ball popped out of the side and scrum half Rob Lofthouse was tackled as he gathered it. With the clock ticking, the visitors took play deep into the home 22 where they proceeded to batter away at the line, helped by a succession of penalties through over-eager defence. The ball was switched left and then right and a winning score seemed inevitable. However, ‘Ensians had other ideas and, through spirit and determination, the home defence held as the final whistle went. Both sides served up a fine contest with the outcome in doubt until the final minute, but in the end ‘Ensians’ solid defence carried the day. With Yarnbury dropping out, the fixture team of tempo, Beardo & John churchman got to work & picked up Burley 2nds. Whether it was new year resolutions or players wanting to run off the Christmas pud, both firsts & seconds had full benches to make a positive start to 2018. With the first team bursting at the seams, tempo had a few 1st teamers to strengthen the ranks amongst the 2nd team faithful, & without them it would of being a different result against a strong Burley 2nds. With a front row of bonner, john offer [ younger than he looks] & mick groves, with wheely & ray drake on the bench, there was plenty of grunt. The tenniswood twins started in the engine room, with mick Wilson on the bench. Ben smith played 6, & joe ridgeway at 7 to cause problems for Burley, while father dan put on the 8 shirt after getting back early from an anger management course for gingers. Jacob wragg played 9 to get some vocal exercise [ shouting at the 2nd team slackers! ], while Kristian keinhorst put on the 10 shirt after traveling the world for 6 months, to try find himself [ hes now called Kristina ! ]. Alex [ the shoulders] & dom oddy played 12 / 13 while dave [ the hands ] smith & lukeasz manned the wings, with captain conner at fullback. James smith & mick birts covered backrow to the wings on the subs bench. Burley started strong & a foot in touch denied them an early score. Alex the shoulders became alex the hamstring as he limped off after 5 minutes, to be replaced at 12 by the strong running trucker [ james smith ]. Burley attacked again using the solid forward pack & after several phases, drove over to make it 5 – 0 on 10 minutes. This made the 2nds realise that having a few 1st teamers didn’t mean it was going to be easy !. from the kickoff, Ensians tore into Burley, & a knock on gave them a scrum to attack off. strong runs by ben smith, mick groves & john offer made good ground, & quick hands by Jacob & Kristina gave captain conner half a gap, & he was through to make it 5 apiece on 14 minutes. With the ref been in his 70s, he didn’t like the modern lineouts with players moving, so ginger john had to think outside the box, which was hurting his head, [ 2 or 4 ].The Ensians scrum was solid & causing Burley problems & a dan ridgeway break with Jacob, got in behind Burleys defence. Kristina used forwards & backs, with oddy to the fore to try break through, until he hit james smith on a line to smash his way through several defenders & it was 10 – 5 on 22 minutes [ oh to have a proper standoff !! ]. With bret & ben smith been thrown into the clouds by bonner, groves & matty t, a competent Burley 2nds were under pressure all game. In the loose, joe was tackling anything that moved & ben smiths pick & goes punished Burley time & again. Kristina used james & oddy to hold the defence, before pushing it wide for dave, conner & lukeasz to run the wide channels, only for lukeasz to get stripped over the line. A great line by matty t, off a ben smith break pulled in Burley, before a simple pass put dave [ the hands ] smith in at the corner after not catching a ball all day long # when it matters “ to make it 15 – 5 on 30 minutes, & there was just time for bret to put in one of his legendary bad kick returns before the half time oranges. The 2nd half started with Burley using the slope to kick Ensians into their 22 & after several drives, they touched down in the corner to make it 15 – 10. Ensians were now having to play out of there 22 with the fullback kicking them back at every opportunity, but the fresh legs of wheely, mick Wilson & ray helped the pack out. Breaks by Jacob, mick, james & ben smith took the team up field for Kristina to put oddy into space & a little shimy, turn of pace & a bad dummy took him through several defenders to score. matty managed to add the 2 points to make it 22 – 10. Burley came straight back & a great Crossfield kick put the centre in to bring them within 7 points at 22 - 15. A frantic last 10 minutes saw Burley having the lions share, with a try saving tackle by captain conner stopping a certain try after the ball was deemed to spill forward. The final whistle couldn’t come quick enough. An entertaining game played in good spirit with Kristian making a difference at 10 by keeping the ball moving.